I have three Linn music streamers around my house and LInn music server on QNAP NAS. The problem is that original Linn app on all iPhones/iPads i have cannot see and i.e cannot control those streamers. Inteesting, that 1 time of 10 all will work - i will see all my streamers and all works, but in most cases the app on the iPhone/iPad can see only one Linn device out of three. Also should be noted: my laptop can see all 3 streamers when connetcted by wire, but can see only 1 streamer when connected over wifi. Linn Streamer C (conencted by wire directly). Could the issue be with double TP-Link switches in cascade ? And why occasionally everythng works? NB it doesn't matter to what Mesh point the WiFi clien is connected). @constantin-potoshin what mode is the second instant unit set to ? I am out of home for a week. so cannot check that. But it was a straightforward set-up through the app. Amplifi B is expanding Amplifi A. Amplifi A has the internet connection. and is visible as mesh point. Again, i can see Streamer C through laptop with wired connection. It is visible in the app as wired client. @constantin-potoshin I would say a great starting point to test the switches would be to move streamer A and connect it to Instant A. Then if that works, reconnect your first switch and connect there and test again, so on and so forth. When you say most cases your iPhone can see only one Linn device, Im assuming this is Streamer C in your diagram? Is all content viewable as well? because your NAS is after your cascading switches. I will do some tests next week when i am back. 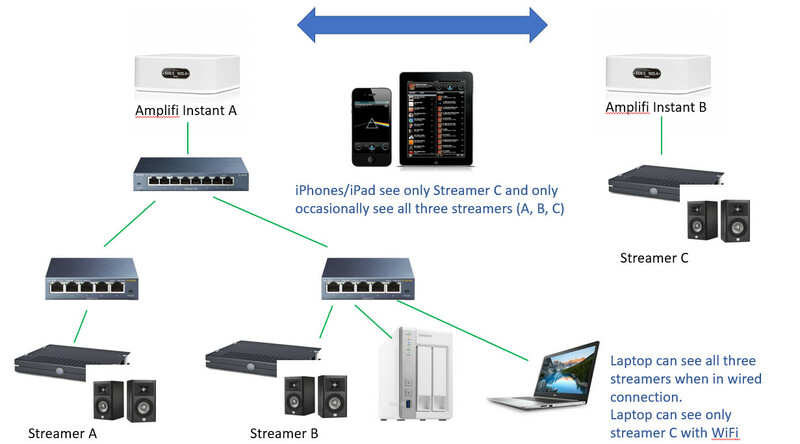 You say: "When you say most cases your iPhone can see only one Linn device, Im assuming this is Streamer C in your diagram? Is all content viewable as well? because your NAS is after your cascading switches." That is correct. iPhone can see Streamer C. And NAS content is not visible . although i have invetsigated only one service - Multimedia Server. I should check other services from other apps. Well, i did the easiest test i could do - i have connected one of the bottom line switches directly to Amplifi A (as on the picture). And instantly Streamer B and Qnap Music Server appeared on the iPhone app. So clearly the issue is with 2 switches cascading. Any advice here? (Apart from upgrading to Amplifi HD Router). @constantin-potoshin do any of the sites support spanning tree protocol that might help if the amplifi does just incase of a loop. Hi @constantin-potoshin - if you put 2 switches in front of Streamer C connected to Instant B does it disappear? The Linn DS use UPnP to control them. Hi allthank you for your input. I was extensively travelling last 2 weeks and had no time to do proper testing. But, "something" has happened during my absence and today (for the last 3 days) everything works. I can see all Linn stuff on my iphone and laptop over wifi. So all is fine. I know, that just before i have returned home, i had a power outage in my home. So my guess, is that all devices were "rebooted" and after that everything works. So my theory is that old hint "reboot everything" did the job. I have had power switched off in the house a couple of times again during weekend. But still all works fine. NB. If you would like that i do test something - let me know. @constantin-potoshin it's a software function that prevents loops in the network of there is a redundant path, eg two switches connected together and both of the switches are connected together as well as to the router, it's more detailed that that bit that's me simplifying it. It would disable the connection between the switches untill one of them had the main connection to the router severed. I was thinking since it induces a delay in the connection it might help, with your issue as in delay the devices from connecting all at once. Because you have multiple switches, but it would require the dev team to implement it.